Please note that your screens may look different, depending upon the type and version of email software you utilize. From the main menu, choose Tools and then Account Settings. 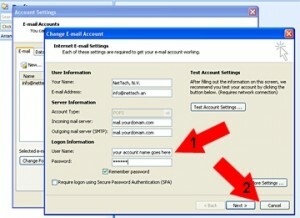 Double-click on the account you wish to amend, and you will be given the screen pictured at right. 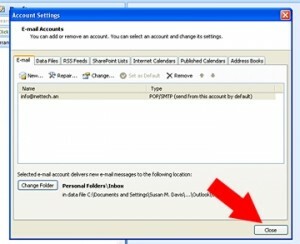 You’ll find your account name in the box illustrated by the red arrow. Make a note of it and then click cancel.